The Great Galactic Emperor has decreed the Great Space Race is on! Can you, as representative of your ill-fated species, pilot your starship to victory? You must, for those who fail to win doom their species to total annihilation. Keep your tentacles to the floor and your eyestalks on the finish line as you navigate your way through minefields, asteroids and wormholes, but just don't forget - stay away from the Space Amoeba! The Great Space Race is a board game for 3-6 players. The game consists of the track, ships, counters and 3 separate decks of cards. Players pilot their spaceship around the hex-based track, dodging all sorts of obstacles (mines, black holes, the other players' ships, etc) in an attempt to be the first to complete 3 laps. Movement is handled by simultaneous selection of movement cards, but unlike in RoboRally these cards are much more varied, combining forward movement, sliding movement, and turning into neat moves such as the Barrel Roll, the Dragons Tail, and the Broken Arrow. 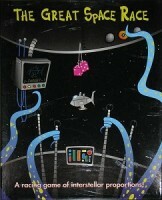 Add a Review for "The Great Space Race"